Colliding elements of chamber music, Delta blues, soul, West-African rhythm, and straightforward rock, The Barr Brothers’s Andrew and Brad Barr (The Slip), Sarah Pagé (Esmerine) and Andrés Vial utilized enchanting harp, pump organ, vibraphone, and traditional rock outfit instrumentation to bring something to TURF’s premiere set that was Frankenstein experimental in its parts but folk in its sum; the perfect fit for the inaugural presentation of a festival testing the waters of Toronto’s outdoor music scene. Set highlights included guitarist Brad Barr providing string-on-string threading on his Silvertone for “Beggar in the Morning,” the classically trained Sarah Pagé leaving harp to play guitar at one point, and the band gathering around a single mic to sing “Little Lover” as Brad and Andrew Barr played guitar and banjo (respectively). 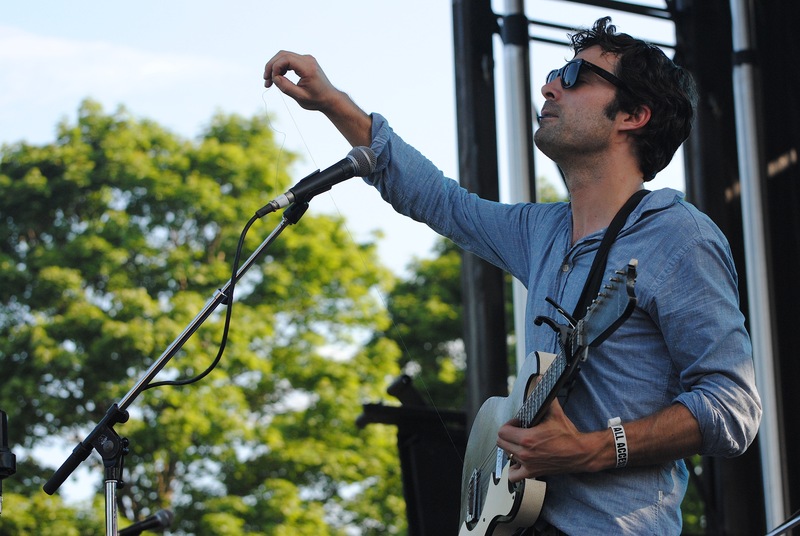 This entry was posted in Burden of Salt and tagged "Beggar in the Morning", "Little Lover", Andrés Vial, Andrew Barr, Brad Barr, Esmerine, Sarah Pagé, The Barr Brothers, The Slip, Toronto Urban Roots Fest, TURF on July 5, 2013 by Tom Beedham.